1. Color-coordinate the outlets. 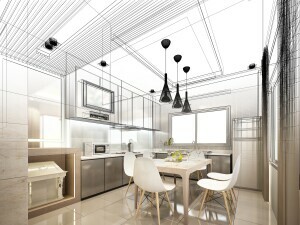 Local building codes often state that there must be an electrical outlet every 4 feet in the kitchen. White outlets are seemingly the color of choice for electricians — and therein lies the bane of my design existence. With their glaring contrast, white outlets in a nonwhite backsplash detract from the beauty of the tile. Fortunately, you can avoid this dilemma by coordinating your outlets and wall plates with the color of your backsplash tile. 2. Provide task lighting. The primary purpose of undercabinet lighting is to illuminate the countertop, which in turn makes food preparation easier on the eyes. Always install the task light toward the front of the cabinet, not toward the back. light. 3. Don’t crowd the hood. When using a chimney hood, always leave at least 2 to 3 inches between the hood and the wall cabinets to the left and right. Visually, the hood will not look cramped, and the sides of the cabinets will stay cleaner longer. 4. Countersink the screw. The cabinet next to a Lazy Susan cabinet with a bifold door often shows scratches over time. 5. Account for lid storage. Having to store pot lids can be a nightmare. There are many ways to solve this problem, but my favorite is to create a divider in a pullout drawer, as shown in this photo.